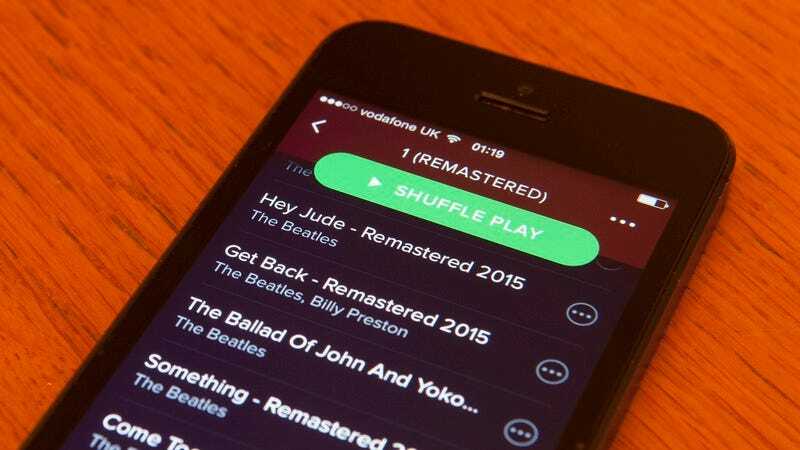 Up until now, the non-premium version of Spotify has been a glorious playground of freedom, a digital destination where users can come and go as they please while listening to any song they want (assuming it’s available on Spotify). Unfortunately, the hungry maw of capitalism must eventually come for us all, and Spotify has just announced that it has signed a deal with Universal Music Group to keep the label’s new albums out of the free Spotify tier for a period of two weeks after they’re released. This comes from Fact Magazine, which notes that UMG simply has “the option” to do this, so it won’t be a universal rule, but it seems safe to assume that big, high-profile artists will get the delay. Naturally, Spotify is presenting this as a bonus for premium subscribers, and in a slightly troubling statement that doesn’t bode well for artists who aren’t big or high-profile, Spotify says that “not every album by every artist should be released the same way.” That kind of attitude seems to be suggesting that this new level of separate premium albums is only going to get more pronounced, but only time will tell of other major labels jump on deals like this.